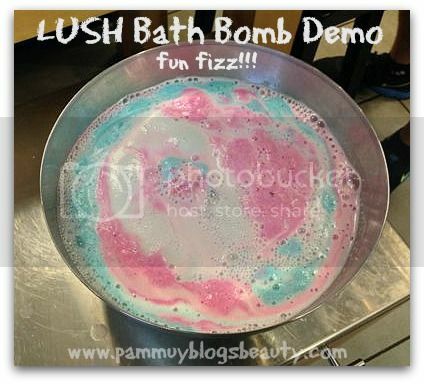 Pammy Blogs Beauty: LUSH Store Tour and Discovering the Best LUSH Products for Pregnancy Pampering! 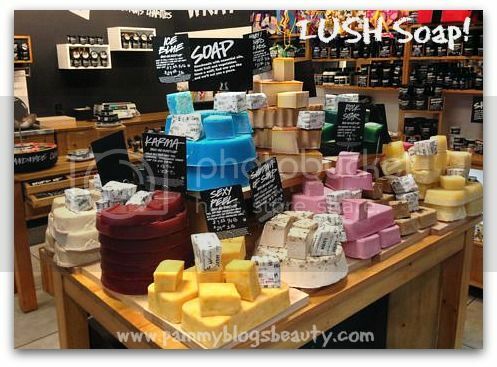 LUSH Store Tour and Discovering the Best LUSH Products for Pregnancy Pampering! Are you looking for a fun shopping experience? Do you have a LUSH store or a LUSH department (in a Macy's) near you? I highly recommend stopping into your nearest LUSH location to experience all that the store has to offer! Recently, I toured the LUSH "Mall of Georgia" store location. What a fun experience! Not only was that particular trip fun, but also I should mention that I enjoy exploring LUSH products every time I step into a LUSH store or LUSH store department. For my LUSH store tour, I had one purpose in mind: Pregnancy Pampering!!! As many of you know, pregnancy can be flat out exhausting.Your legs are aching, your skin is stretching, your skin type and hair type may have changed, and you basically can just feel achy, bloated, and tired. Plus, you can't use many of your usual standbys for oily skin and breakouts (no benzol peroxide nor retinol while pregnant) and body aches (Advil is another no-no). Whenever I complain to my OB about fatigue and aches...what does he recommend??? A bath!!! So, what is a girl to do? Me? 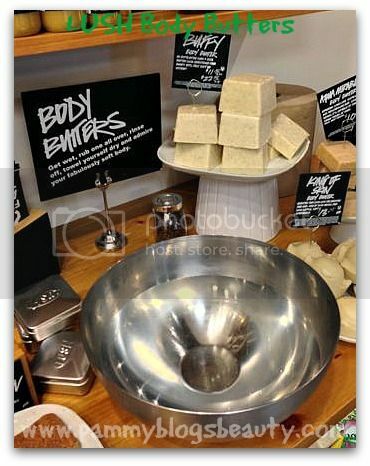 I headed right to my very favorite bath and body store...LUSH! While I heard about and smelled items in almost all of the stores categories, I am going to focus a bit more on the items that I ended up taking home (otherwise this post would be WAY too long, lol!). There is no question. When it comes to beauty pampering, LUSH has you totally covered! Can you believe that I didn't pick up a bath bomb (kicking self! must go back!!!). I just had to include the bath bombs as they really are probably the "most fun" of all of the LUSH bath items. As you can see from the photo above, there are a zillion to choose from. I smelled almost all of them and just about all of the scents appealed to me. LUSH scents are certainly not for the faint-at-heart. I mean, you can smell the LUSH store all the way down the hallway in the mall! 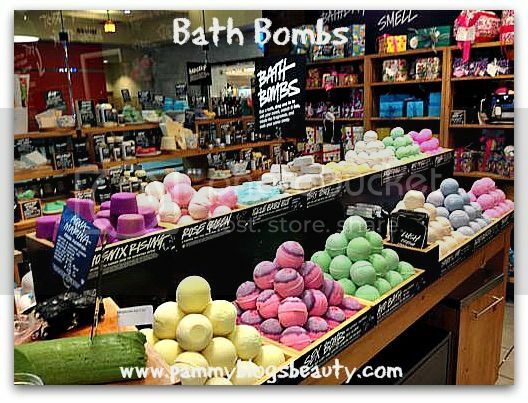 There is no question that these heavily scented bath bombs would scent not only your bathroom, but likely your whole home too while you use it! Each bath bomb has a different effect in the water creating fizzy colored bubbles and bath water. So fun!!! One of my main pregnancy complaints is my issue with my skin changing type and breaking out. I usually have combo/normal skin that rarely breakouts. However, with pregnancy, my skin has become quite oily and is extremely breakout-prone (especially on my chin). I am struggling with fighting zits on a daily basis. Combine this with the fact that pregnant women can't use standard zit-zapping ingredients like salicylic acid and benzol peroxide...you can imagine how frustrating this is! During my LUSH store tour I mentioned needing something natural and pregnancy-safe to combat breakouts, and my tour guide showed me this product! 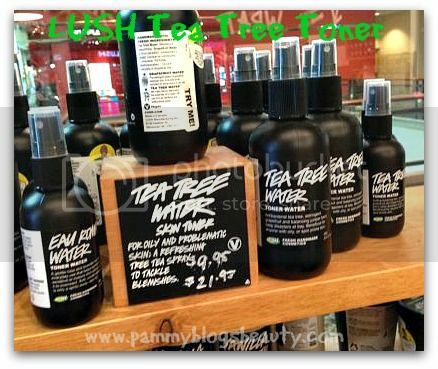 This refreshing Tea Tree toner contains Tea Tree which is a natural anti-fungal and anti-bacterial ingredient. It also contains juniper berry and grapefruit to balance skin and help fight blemishes. This toner is soothing and alcohol-free. I find that it is really effective in my t-zone area for really giving my skin the extra "cleanse" that it needs to cut back the grease and disinfect my skin. 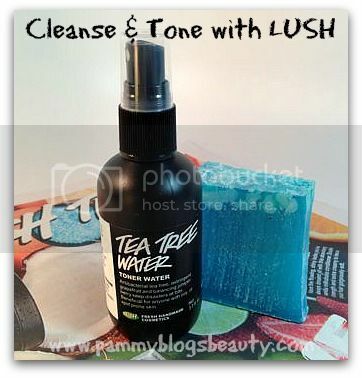 I use this after cleansing. Do you ever use powder? 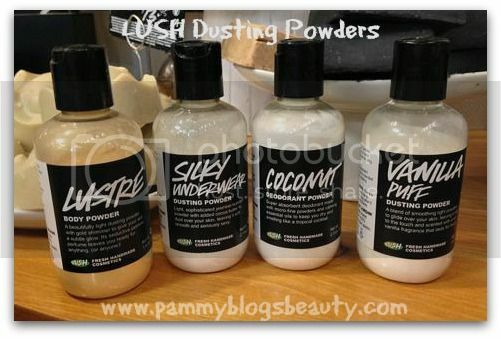 I fully admit that even as a product-junkie, I haven never routinely used dusting powder! It honestly just never occurred to me! My LUSH tour guide recommended using a dusting powder to not only help me to feel drier and fresher but also to "seal in" my moisturizer. I love the idea of using a rich moisturizer and then sealing it off with this powder to give your skin a dry yet hydrated feel. 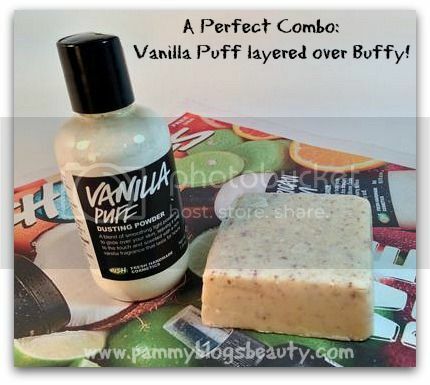 I chose the Vanilla Puff powder which smells amazing!!! I have an affinity for vanilla body products and perfumes. So, this product is perfect for scent layering, too! 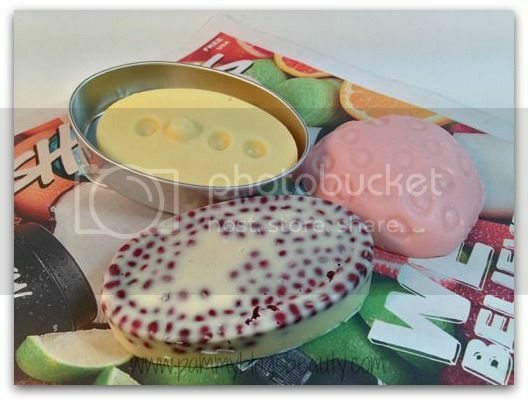 Last, but not least, lets talk about LUSH's amazing massage bars! My achy and swollen pregnant body NEEDS massage! Let me tell you, these massage bars from LUSH are a total treat! 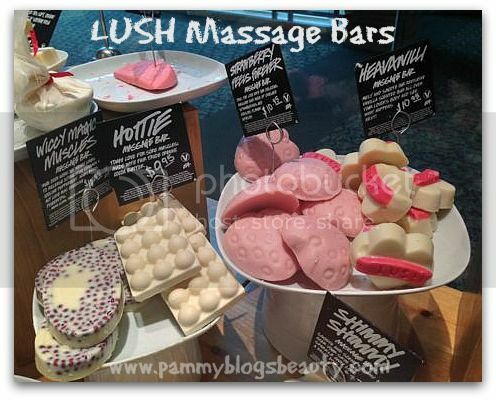 If anyone needs an excuse to get their husband to give them massages, you must scope out these massage bars from LUSH! I picked out three massage bars all for different needs: the Wiccy Magic Muscles bar, the Strawberry Fields Forever bar, and the Therapy Bar. The Wiccy bar is probably my favorite. It is for achy muscles...and that is pretty much what I have with this pregnancy. The Wiccy bar is the "Ben Gay" of LUSH. It gives your skin an "icy hot" feeling with its peppermint and cinnamon spice oils. If you love the smell of cinnamon, then you will love how this bar smells! The Strawberry Fields Forever bar drew me in with its amazing strawberry scent! Have I mentioned that I am obsessed with the scent of Strawberry lately? Finally, the Therapy Bar...love the herbal scent and it leaves you so moisturized! As ya'll can tell, I am a huge LUSH fan! LUSH is my quintessential go-to brand when I am looking to do some self-pampering. My LUSH pregnancy-pampering products have transformed my bathroom into a little mini-spa. My favorite way to relax in the evens has been to retreat to my bathroom after my toddler is asleep to indulge myself in a LUSH bath followed up by a massage with my LUSH massage bars. i LOVE Lush!!! I love their massage bars and I live for their Ocean Salt. I didn't realize you were pregnant - congrats!